The contraceptive implant is a small plastic rod which is inserted underneath the skin on the inside of the upper arm. It can stay there for up to three years to slowly release the hormone progestogen. Stops the ovaries from releasing an egg each month. Thickens the mucus at the entrance to the uterus (cervix) to stop sperm from moving into the uterus. The implant is 99.9% effective at preventing pregnancy. You don’t have to remember to take a pill every day. The implant is immediately effective if inserted during the first five days of your period. It’s not obvious that you have an implant. It lasts for three years but if it doesn’t suit, you can have it removed. It’s safe to use if you’re breastfeeding or if you can’t take oestrogen. Fertility returns as soon as it’s taken out. An inexpensive form of contraception in the long term if you have a Medicare card. 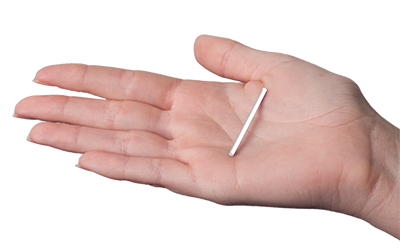 The implant can prevent unplanned pregnancy for up to 3 years and can be removed at any time. The contraceptive implant does not protect against STIs but can be used at the same time as condoms. Regular period patterns will change and you can get unpredictable or irregular bleeding (talk to your doctor about this as there are many ways to manage it). The implant can only be inserted or removed by a trained professional in a minor surgical procedure. Insertion and removal can cause bruising and some soreness. It may leave a very small scar. Can anyone use the implant? Serious health problems are very rare with the implant. You can’t use it if you are taking some kinds of medicine – talk to your doctor about what you’re taking. The implant must be inserted by a specially trained doctor or nurse. Many doctors have this training – or visit a Family Planning NSW clinic.